In his brief life John Lennon managed to affect just about everyone and everything that came within reach of his brilliant imagination. I can still remember where I was when I first saw the Beatles. I was sitting in front of the T.V. screen, young, obsessed, and beatlemanic, waiting for Ed Sullivan to say, "and now for a real treat, the BEATLES!," and there they were, the band that made Liverpool famous, playing the guitar that helped create a musical legend. 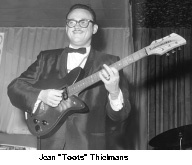 John Lennon's love and passion for Rickenbackers began when he heard jazz great Toots Thielemans play at a performance in Germany during the Beatles' early days. He bought his first 325 in Hamburg and the rest is now part of the Rickenbacker chronicles. So it was in 1990 that we at Rickenbacker were pleased to announce that we had received permission from the Lennon estate to reissue a special replica of John Lennon's 1963 Model 325 Rickenbacker. Three versions of this limited edition model are available: the 325JL 3/4 neck, which John used up through the movie, "Help! ", the 355JL which is the same as the 325JL except for a full scale neck, and the 355/12JL, a twelve string version of the 355 JL. The full scale neck versions of the John Lennon model make the guitar more versatile to the professional musician. The John Lennon Limited Edition has unique features which distinguish it from the 325V63. The headstock is smaller, exactly reproduced from the same tooling used to manufacture John's original guitar. In addition, the pickguard is a duplicate in size, shape and placement of knobs to its historic predecessor. 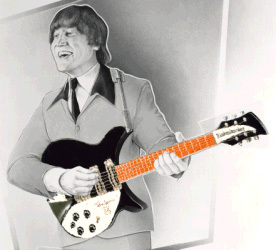 And, of course, each new John Lennon Limited Edition guitar comes with a certificate of authenticity. All of the edition of 2000 have now been delivered so the memory may be fading; on the other hand, there will never be another John Lennon but his memory will live on in the Rickenbacker guitar he made his own.